An early start was needed today to ensure our ticket to Skomer Island. 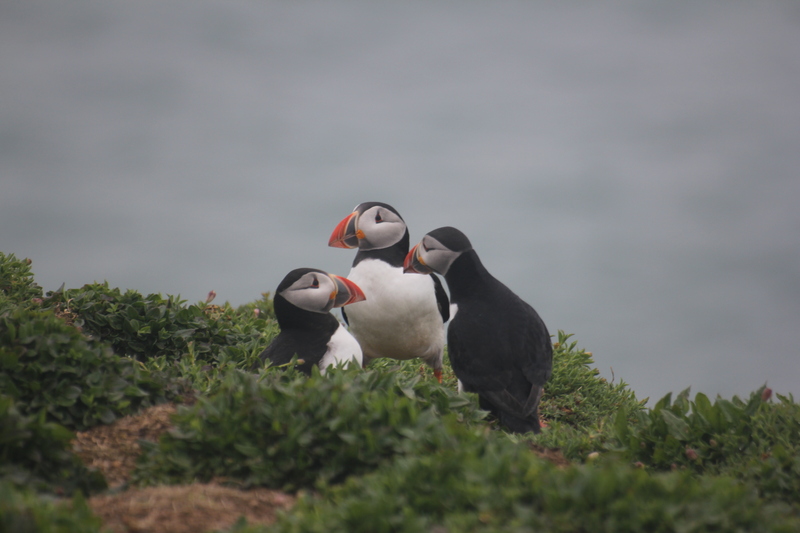 Although the weather suggested that there wouldn’t be a rush by the masses to Skomer Island, it was Sunday and it would be a shame for the ladies to miss the opportunity to visit the Puffin colony after travelling all the way from Minnesota. The journey itself from St David’s to Martins Haven was worth the drive, following picturesque, car width lanes, strewn with flowers. Every now and then a cove or beach would be thrown up in front of us: Newgale, Druidstone, Broad Haven, Little Haven and Marloes. Names from childhood holidays past. 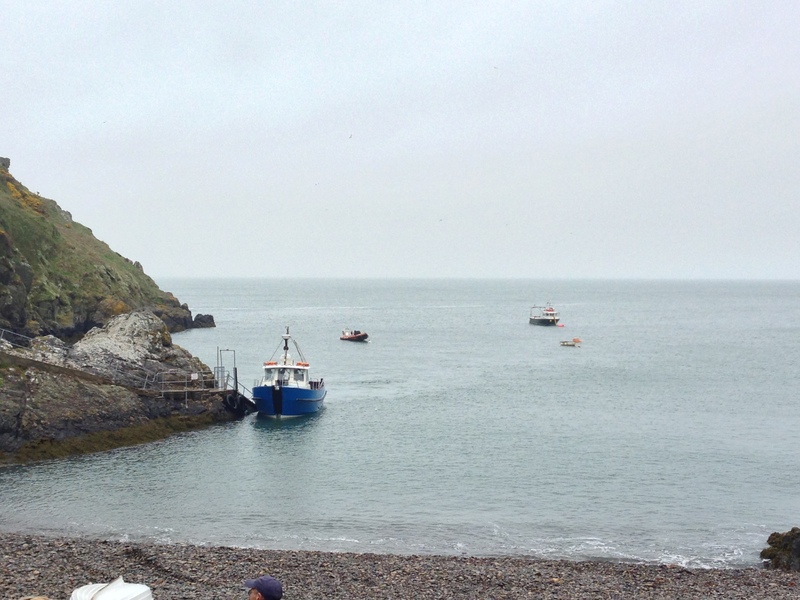 The Dale Princess is the only boat landing passengers on Skomer and numbers are limited to 250 per day. She was waiting patiently for us at the quay at Martins Haven. The day could be a challenge as you have to stay there at least a few hours irrespective of the weather. There are no shops on the island and just one place to shelter in the old farmhouse, where some toilets can be found. There is however, more than enough wildlife to see to help the hours fly by. Skomer Island is one of those places that have to be visited. It is a National Nature Reserve, a Site of Special Scientific Interest, a Special Protection Area and largely, an Ancient Monument. A walk around the island reveals a coastline of sheltered bays, exposed headlands, towering cliff faces covered with nesting birds and deep inlets with coves quite often covered with seals at low tide. The rocks are a riot of colour with birds and the graduated colours of lichen. The Wick is probably one of the biggest draws on the island , a sheer cliff carved with ledges that are ideally suited to nesting seabirds. It is partly enclosed by an amphitheatre of sloping stone, which provides a perfect view of the most visited inhabitants, the Puffins: colourful and clownlike, busy with their nest-building, egg laying and fish gathering, with the expectant arrival of their chicks or pufflings. Initially the weather was so damp and blustery there was a fear of mutiny amongst the ladies, with word of an unscheduled boat departure at 12pm, instead of hanging around for the scheduled 3 o’clock boat. With a desire to see the Puffins and enjoy the rest of the island, a delayed food break at the farm shelter was enough to take us past the point of no return on the early boat. 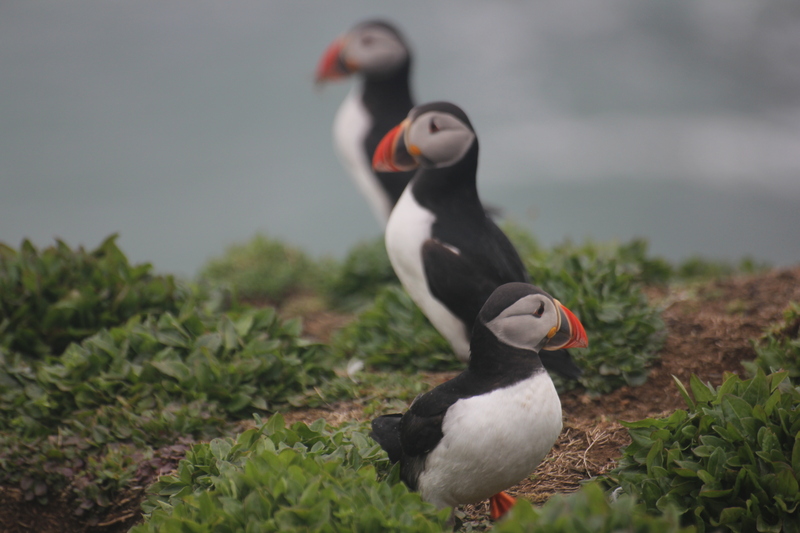 With luck on our side the weather lifted and we were rewarded with the ultimate goal – a Puffin loaded cliff colony. The Puffins return every year to the same burrow and it’s unbelievable how they find their way back every year let alone each fishing trip. 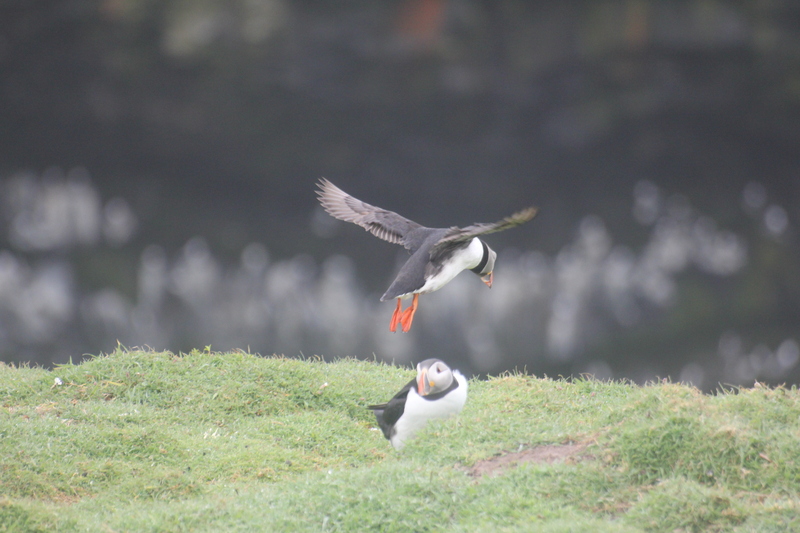 We are too early to see the classic view of Puffins with their bills filled with Sand Eels, as this happens with the arrival of the chicks but, we did get to see them hurrying in and out of their burrows, beaks full of twigs, busy with nest-building. In flight the birds take on a completely different character with a very rapid flight pattern, often skimming the surface of the water. On return to land their habit is very akin to a helicopter landing, with wings wheeling and their undercarriage wide apart, webbed feet extended forward, a slight pause on contact with the ground, to ensure they are properly down and then a quick penguin-like waddle off to their burrow. These are truly marvellous birds! 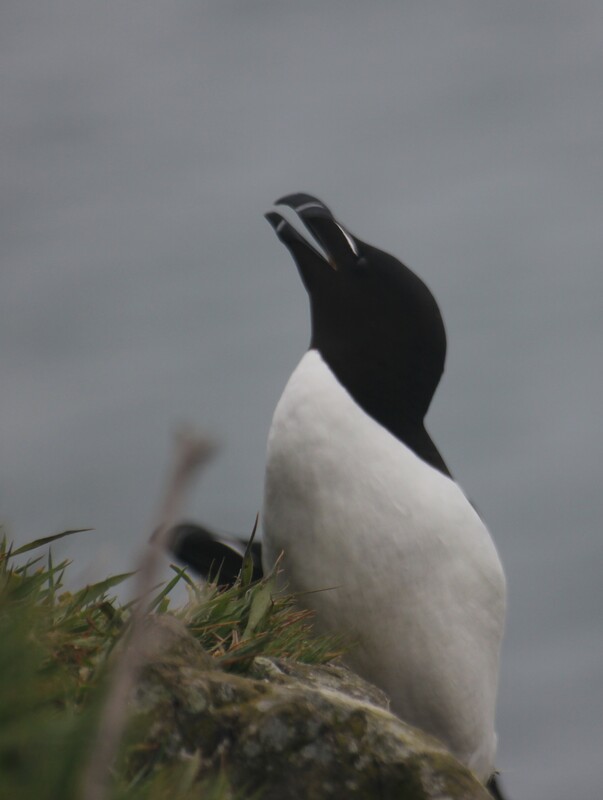 The island is also home to 1/3 of the Worlds population of Manx Shearwaters with 300,000 nesting pairs and whilst invisible to the day tripper, a magical experience happens at dusk, when the fishing birds return to their burrows at night. I am told that the noise is almost deafening with such numbers in flight all at the same time. I feel another visit is required to see this marvellous sight. There is also a huge seal population which soon congregated on the beach at North Haven at low-tide. The Garland Stone is another excellent viewing point for seal later in the year, at the end of summer. 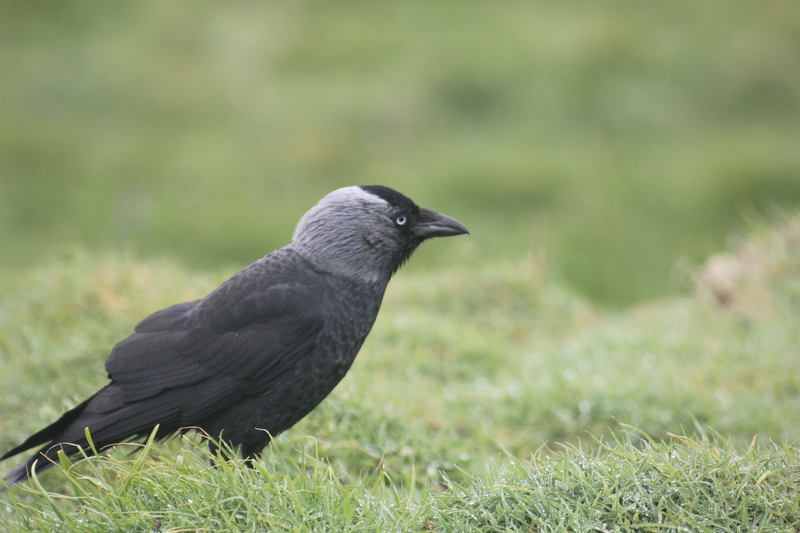 With all sort of other birds to be seen, including Short-Eared Owls (1/4 of the Welsh Population with 5/6 pairs), Guillemots, Razorbills, Buzzards, Peregrine Falcons, Jackdaws, Ravens, Wheatears, and more the island is diverse. I can imagine a completely different atmosphere on a clear sunny day. Next Next post: Childhood memories……..